View morning Alms Ritual at a golden temple then embark on a day tour including the Wat Sieng Thong (the Golden Monastery) and Wat Visumalat. Take a trip to Pak Ou caves, filled with thousands of Buddha images. On the way visit Ban Xang Hai to learn about the traditional process of making local sticky rice alcohol (called Lao Lao). Enjoy a picnic lunch before returning to Luang Prabang. Day trip visiting the local market, Royal Palaca and Wat Mai. Transfer to the airport for the filght to Hanoi. Overnight in Hanoi. Embark on a city tour of this charming capital, including the HCM Mausolem, Temple of Literature and Army Museum. Drive to UNESCO World Heritage listed Halong Bay and board a traditional junk for an overnight cruise in crystalline emerald waters. Feast on sumptuous fresh, local seafood, swim, explore limestone caves and kayak in secluded lagoons. Spend the morning cruising through Halong Bay and transfer back to Hanoi after lunch for your onward flight to Hue. Begin a city tour of UNESCO monuments including the Imperial Citadel and Imperial Tombs of the Emperors. 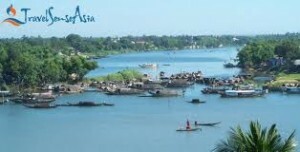 Relax on a boat trip on the Perfume River to Thien Mu Pagoda. Drive along the beautiful coastal road to Hoi An via Hai Van Pass, Danang and China Beach to the UNESCO Town of Hoi An, visiting the Cham Museum along the way. Arrive in HCMC and enjoy a half day city tour including the War Remnants Museum, Reunification Palace, the old Post Office and Notre Dame Cathedral. Morning tour to Cu Chi tunnels. Fly to Siem Reap and set off on an afternoon tour starting at Angkor Thom, then proceed to the hilltop temple of Phnom Bakheng for a truly memorable sunset. Early morning start to watch the sunrise over Angkor Wat. After breakfast start exploring the mysterious Royal city Angkor Thom. Further on visit the surroundings of the complex including the Baphou, Elephant Terraces, Lepper King Terrace and Royal Place area. End the day at Phnom Bakheng, the first major temple to be constructed in the Angkor area. Watch the sunset from the 2nd tier, offering a panoramic view of Angkor Wat and West Baray. After breakfast, continue your exploration with a visit to the Roulous group of temples. Afternoon free at leisure. Depart for your connecting flight. + Check in time is normally at 14.00, check out time is normally at 12.00. Early check in or check out is upon on availability of the hotels. + The detailed itinerary of Halong bay Cruises might be different depends on your junk choice.